When I think about teaching vocabulary, I often think about readalouds. Quality readalouds are often filled with interesting, useful vocabulary words that we can teach our students. However, another great time to teach vocabulary (and vocabulary strategies) is during shared reading. 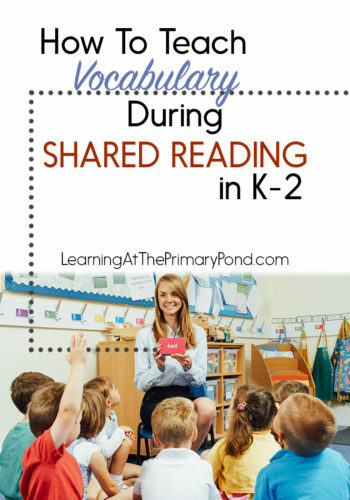 In today’s post, I’ll share tips for teaching vocabulary during shared reading, as well as some free vocabulary strategy posters! 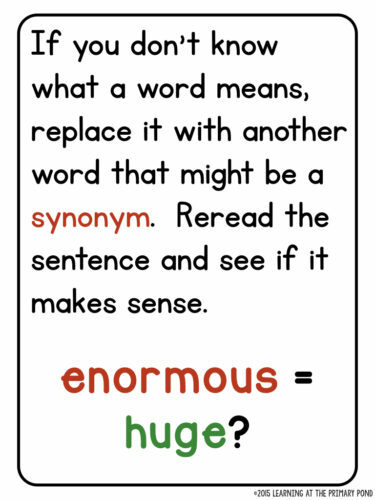 Most of the vocabulary words found in shared reading texts (especially in Kinder and first, and sometimes second grade) can be considered Tier One Words. Tier One words are those that are frequently used in the English language (basic terms like “walk” or “river”). Students will inherently learn many of these words from their everyday experiences and school instruction. Tier Two words don’t appear as often and are harder for students to learn through context (i.e., “merchant”). Beck recommends that most vocabulary instruction focus on these Tier Two words. Tier Three words are those that are encountered even less frequently and are specific to academic subject matter (i.e., “circumference”). Again, in my experience, many of the words in shared reading texts I use with my primary students are Tier One words. It’s one thing for students to understand what a word means (more or less) when they hear it or read it. For students to be able to use the word in their speech or writing, however, they must have a better grasp of the word. 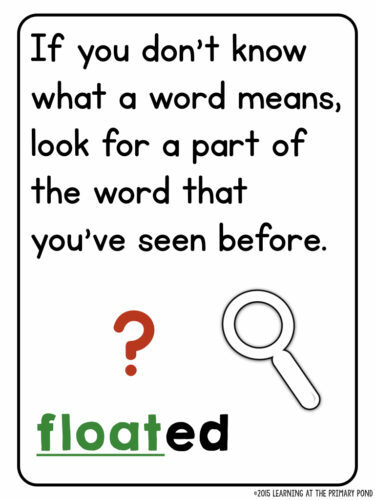 Through shared reading and extension activities, I have an opportunity to help add these Tier One words to students’ productive vocabulary (using it in speech and writing), when it may have only been part of their receptive vocabulary (understanding it when they hear or read it) previously. Some of our students actually do need instruction in those “simple” Tier One words. Marzano states in Teaching Basic and Advanced Vocabulary (2010): “There are at least two types of students who are in unique, precarious situations regarding basic vocabulary development: students from a background of poverty…and English Language Learners” (p. 5). I don’t love the poverty generalization from this quote, because there are always many exceptions. I don’t ever think it’s a good idea to assume that children from certain backgrounds will inherently have lower vocabularies. However, given the research, the growing number of ELLs in our classrooms, and the fact that all children are perhaps engaging in fewer conversations with adults (more screen time), I think it’s safe to say that many of our students can benefit from Tier One vocabulary instruction. Of course, Tier Two words also appear in our shared reading texts, especially as the texts become more difficult. Shared reading is a great time to teach Tier Two words, also. In addition to direct vocabulary instruction, I model specific vocabulary strategies during shared reading. Also, since students can see the words of the text, they can actively participate in using the strategies I teach (guided practice). So what are those strategies? I’ve listed 7 of them below (and I have free strategy posters for you)! I don’t teach all of these strategies in every grade level. I typically teach strategies 1-3 in Kindergarten (sometimes also #4), strategies 1-5 in first grade, and strategies 1-6 in second grade. I teach strategy #7 in all grades. 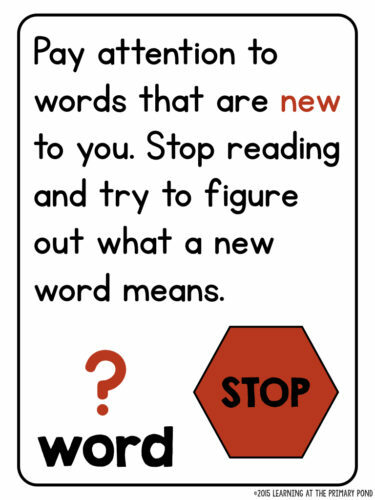 Strategy #1: Pay attention to words that are new to you. Stop reading and try to figure out what a new word means. Strategy #2: If you don’t know what a word means, look at the picture. Strategy #3: If you don’t know what a word means, look for a part of the word that you’ve seen before. 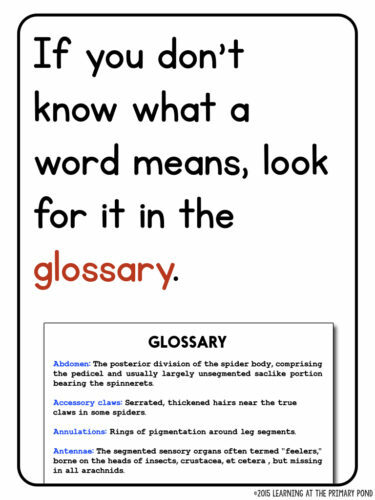 Strategy #4: If you don’t know what a word means, look for it in the glossary. 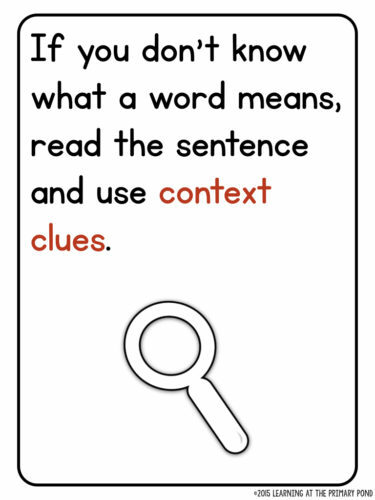 Strategy #5: If you don’t know what a word means, reread the sentence and use context clues. Strategy #6: If you don’t know what a word means, replace it with another word that might be a synonym. Reread the sentence and see if it makes sense. 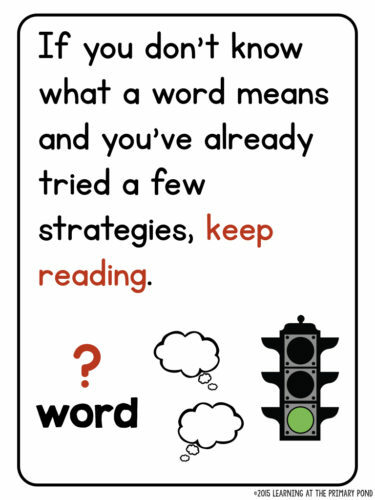 Strategy #7: If you don’t know what a word means and you’ve already tried a few strategies, keep reading. You can download all of these strategy posters by filling in your information below—they will be sent right to your email for free! Shared reading is a great time for direct vocabulary instruction, as well as strategy instruction. If you need resources for teaching shared reading, check out my new shared reading units for Kindergarten, first, or second grade. Click HERE to read about them! Beck, I.L., McKeown, M.G., & Kucan, L. (2002). Bringing words to life: Robust vocabulary instruction. New York: Guilford Press. Marzano, R. J. (2010). Teaching basic and advanced vocabulary. Boston, MA: Heinle. Thank you for the information on vocabulary building. I have 5 year old who is going to kindergarten this year. Working on sight words and sounds. Question?? 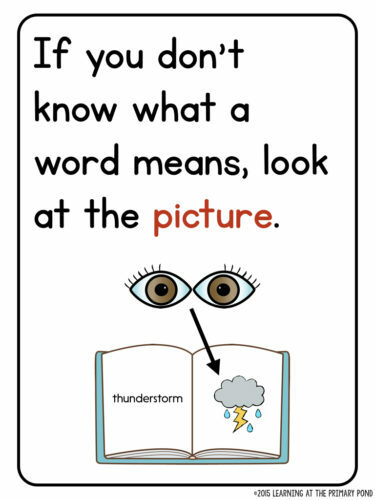 Do you think that learning sight words > you should learn letter sounds (or) learning sight word repeatedly over and over? Sounds will come later?